Buy 3 Tires, Get 4th Tire for $1.00. Receive a discount equal to the price of a single tire when four tires are added to your purchase. Valid on select in stock tires only. Those tires for which discount is available will be identified at the store. All other tires and special order tires are excluded from this offer. Valid when scheduled for installation at West Hills Auto Plex and installation is completed between 3/1/19 through 4/30/19. 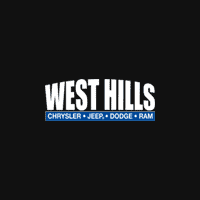 Welcome to West Hills CDJR!